Go for miles and miles marching to your different drummer. 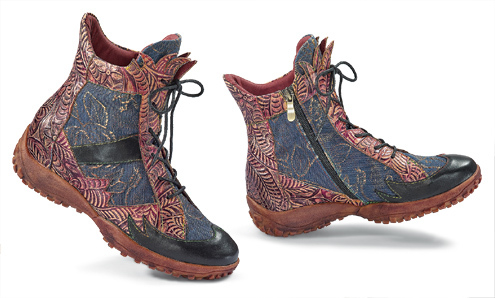 Boldly-tooled leather in botanical patterns trims canvas painted with subtle golden leaves for a folkloric effect. Ankle-high boots with sturdy walking sole feature a side zipper and laces for a perfect fit. Soft fabric lining, cushioned insole. European (U.S.) sizes 35 (4 1/2-5), 36 (5 1/2-6), 37 (6 1/2-7), 38 (7 1/2-8), 39 (8 1/2), 40 (9), 41 (9 1/2-10), 42 (10 1/2 -11). These are cool boots. Do need some breaking in but are pretty comfortable. Boots are excellent - warm, fit well, and they look amazing! I've gotten many compliments on them all three times I've worn them.